I had a mesh-back hat with this logo on it when I was maybe 5 years old. One of my most-prized possessions. The Western Auto store in my home town had it as a giant sticker on the floor, and a poster on the wall, and my Dad had another sticker on his toolbox, right next to one for Thrush mufflers. I can still hear the commercials in my mind, though I haven't heard them with my ears in thirty years: "S! T! P! It's the racer's edge!" I don't like Nascar, and this won't change that, but I like STP and always will, even though I'll likely never use anything they make. For some reason this logo brings back a mood from childhood, an innocent mood, a memory and a feeling of a time when everything was good and right and worry-free in my kid mind. Which is why I want to punch hipster morons when I see them wearing repro-faux vintage STP t-shirts they bought at Target for $8. 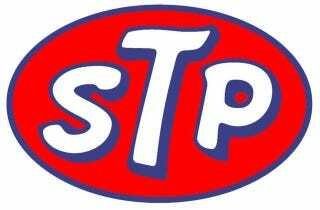 I asked a kid once if he knew what STP was. "Uuuuuuh, wasn't it some uuuuuuuuuh a band from uuuuuuh the 90s or somethin'?" He will never know how closely to him death passed by that day.